Movie Review - 'Ai Weiwei: Never Sorry' - In China, A Persistant Thorn In The State's Side Ai Weiwei: Never Sorry follows the famous artist around the world as he repeatedly irks Chinese authorities with his art and political critiques. Fresh Air's John Powers says the documentary casts important light on the fight for greater freedom in China. Now, millions of Chinese accept the new prosperity and don't ask questions, at least not in public. But there are others who don't keep quiet. One of them is Ai Weiwei, the strikingly bearded, Buddha-bellied artist whose activism doesn't exactly delight the government. Last year, he was disappeared into secret detention for 81 days; last week, he lost a $2.4 million tax case that virtually everyone thinks was trumped up. 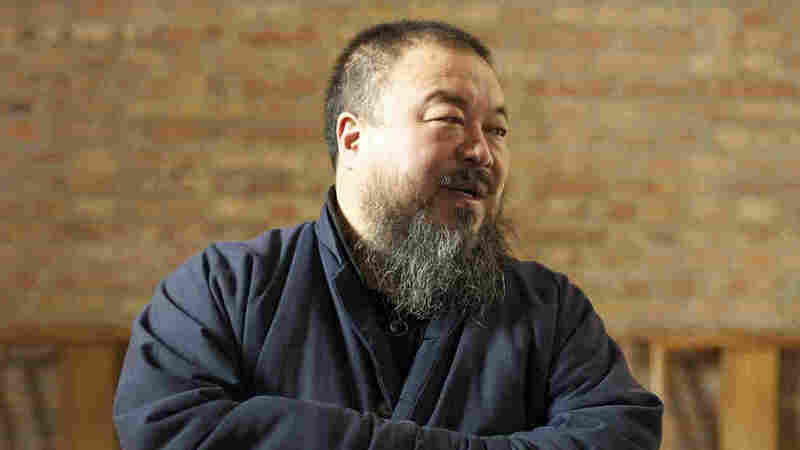 His life is the subject of a new documentary, Ai Weiwei: Never Sorry, by Alison Klayman, who offers a good introduction to the career of this fascinating man who is no shrinking violet. She follows the artist as he puts on international shows and tweaks the authorities on Twitter; she interviews people who know Ai well and shows how many of his ideas are rooted in things he learned while living in New York during the 1980s, where he not only discovered Andy Warhol but also watched the Iran-Contra hearings with a sense of revelation. Along the way, we watch Ai go from being a talented, if slightly glib, conceptual artist — there's a famous photo of him giving the finger to Tiananmen Square — to a political activist who, after working on Beijing's famous Bird's Nest stadium, called China's Olympics party propaganda. In the most compelling footage, Klayman follows Ai's response to the 2008 Sichuan earthquake. He digs up the names of the 5,000 children who died there — the government conceals this information — and honors their memory with an art piece using student backpacks to spell out a slogan. It's the nature of political art that the world is nearly always more interested in the politics than in the art itself. Everyone knew that Alexander Solzhenitsyn was a fervent anti-communist, but most people didn't actually read his novels. And so it is with the media-savvy Ai. He has done some gorgeous, evocative pieces — like his dazzling installation of 100 million sunflower seeds made of porcelain at London's Tate Modern — yet he owes his fame to his anti-government blogposts and Tweets. This has led some to write him off as a self-promoter, one who wins attention — especially in the West — by criticizing China in black-and-white terms even as the country has improved vastly. Now, there's no denying that such charges contain some truth. Ai clearly enjoys being the world-famous Ai Weiwei. Yet this vaulting individualism is Ai's message — and strength — in a country that stifles personal freedom in the name of the collective, even as party bosses enrich themselves. As for claims that Ai is too politically simplistic, the fact is he's an artist, not a thinker. His job isn't to propose solutions but to give those in power a headache. And this he does, tirelessly pointing out the ways that the Communist government hides the truth and doesn't come close to living up to its officially professed ideals. In fact, Ai is actually far less radical than Liu Xiaobo, the heroic Nobel Peace Prize winner currently serving an 11-year prison term for arguing, with exquisite rationality, that China shouldn't be a one-party state. You won't find Ai saying that. But you will find him risking his own freedom to make Chinese life freer. At the beginning of Klayman's film, we visit Ai's family compound in Beijing and learn that it harbors 40 cats. One of them has actually learned how to open doors, and we watch this talented creature leap up and pull down a handle with its paws so that the latch unclicks and the door swings open. What distinguishes human beings from cats, Ai says, is that when cats open a door, they don't close it behind them.